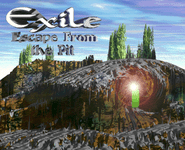 Exile: Escape From the Pit is the first game in the Exile trilogy, which takes place in the strange subterranean world of Exile. Exile is populated by the misfits and malcontents of the surface world, people who were forever banished to the underworld for being too strange, or too antisocial, or having too many incorrect opinions. This is the fate you have just suffered, and it is up to you what to do from here. Will you try to escape the strange prison of Exile, will you try to gain power and save your fellow exiles from the monsters that threaten them, or will you try to gain revenge on the Empire that cast you below? It's up to you!